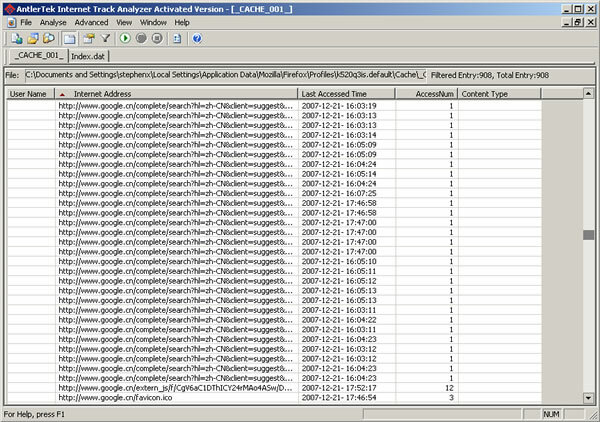 AntlerTek Internet History Analyzer can help you track and search Internet history records of the Windows system. By analyzing the Internet cache and index.dat file, the software can show you the browse history records in detail. Moreover, unlike other history viewers, AntlerTek Internet History Analyzer uses its advanced data recovery engine to scan hard drive for Internet history file fragment to reproduce readable report to users. It can help you track and search Internet history records of the Windows system. ...... Therefore, the software can find and show records that have been deleted from your system. Recovery Engine: Equipped with data recovery engine, can recover deleted or hidden history records. Record Filter: Provide records filter with various condtition setting. Only display the records you want. Various Storage Devices Support: AltDataRecovery can undelete files and recover data from most computer storage devices like hard drive, digital camera storage card and USB drive. Qweas is providing links to AntlerTek Internet History Analyzer 1.0.2010.50 as a courtesy, and makes no representations regarding AntlerTek Internet History Analyzer or any other applications or any information related thereto. Any questions, complaints or claims regarding this application AntlerTek Internet History Analyzer 1.0.2010.50 must be directed to the appropriate software vendor. You may click the publisher link of AntlerTek Internet History Analyzer on the top of this page to get more details about the vendor.